Like the rest of Halloween, trick-or-treating evolved over time. Trick-or-treating rituals like parading in the streets, begging for treats, and wearing costumes were all elements of pre-existing celebrations, including All Saints’ Day, Guy Fawkes Day, Thanksgiving, and Christmas. 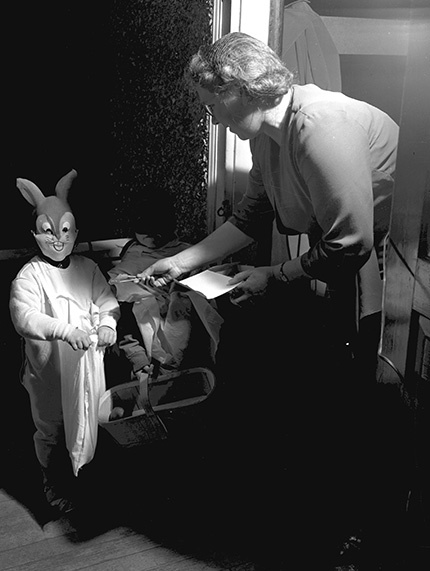 Trick-or-treating as we know it began in the late 1920s. In fact, the earliest recorded usage of the phrase “trick or treat” comes from Blackie, Alberta, where in 1927 a newspaper article reported on pranksters demanding “trick or treat” at houses. 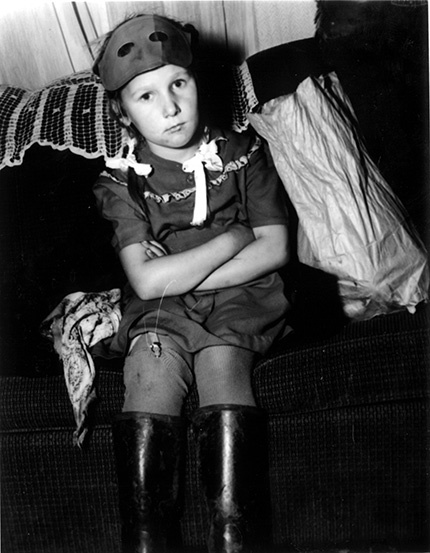 Costumed trick-or-treaters were common in Edmonton by the 1930s. 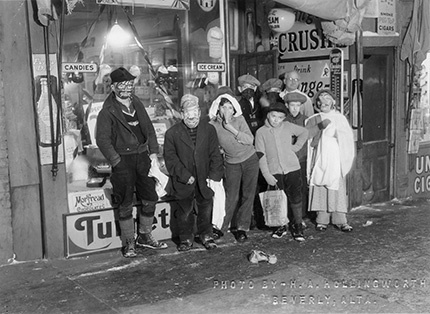 At that time the young revelers would prey mostly on businesses, demanding treats while threatening tricks. Apples were a popular reward, hence the saying “Halloween apples” rather than “trick or treat”. However, other fruits, candies, popcorn, and nuts were all appreciated as well. The children in the above photograph are trick-or-treating at someone’s home. After the end of the Second World War houses became the target of choice for trick-or-treaters. By this time the “trick” was usually just an idle threat. Halloween safety was an issue long before the first (false) reports of poisoned candy came out in the 1960s. Lost children and stolen treats were the most common complaints, though traffic accidents and costumes catching fire were issues as well. - Edmonton Bulletin, page 1, November 1, 1947.